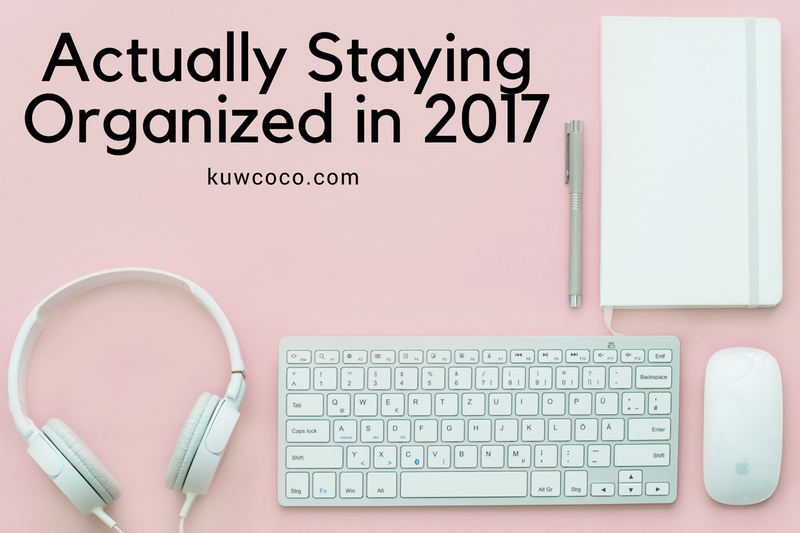 Since were all about being real AF here on Keeping Up With Coco I thought hmm why not share some of my real tips for being organized in 2017 and maybe make real tips with Coco into a mini series or something! Let me know what you think in the comments about it. All right here we go here is how to actually stay organized in 2017. 1. Invest in a decent planner or desk calendar. Go to target and just get one. Before the year started I made a commitment to myself that I would actually use the calendar I bought this year. I have actually written on it weekly and keep it on my desk at all times and it truly helps! I feel like a legit adult and helps me keep track of blog posts and all my appointments. 2. If you ever need to sync up a calendar I highly recommend downloading the app called “Cozi”. Since my mom and I like to keep each other’s schedules on hand so we can both keep track of everything we both have this app and try to keep everything in here as well. We both have access to it at all times and its color-coded and super cute and I have found it to be the best iPhone calendar app out there. 3. This one may be stupid but in my opinion I find this one to actually be the biggest help of all. I need to keep almost all of my iPhone apps in folders, just because they are all labeled with monkey emojis doesn’t mean they don’t help. I have a folder for random apps, photo editing, work, fitness and a blogging folder and feel like even when one app is out of place I feel like my phone is cluttered. 4. And last but not least I also swear by writing literally everything I would ever need to know down in my phone notes. I keep this app located at the bottom so when I’m on both app pages I have complete access to it. I write blog posts randomly, I keep track of the hashtags I use on Instagram and basically everything else I would ever write down is in my notes. Fun fact I literally keep a note of my makeup inventory so I don’t buy the same item twice and can find out my foundation color within seconds. Here are my four best tips for actually staying organized in 2017. I may be a month late to the game but currently not caring! If I can even help one person for 11 months out of the year I would be so happy! How do you guys stay organized? Do you have a number one tip?